There are plenty of reasons for Nick Saban to change his favorite color from Crimson to Burnt Orange. We’re talking Texas, which supposedly will be looking for a new coach any day now. That inevitably leads to Nick Saban. Rumor has it he’d never leave Alabama in a million years. Rumor also has it he’s already been fitted for a Cowboy hat and is working on his “Hook ‘Em" sign. As the suspenseful hours pass, Alabama fans are burning candles in their windows and reciting why Saint Nick should stay. As valid as those reasons may be, it’s not as if Texas doesn’t have unique allure. Here’s the list of things that may pry Saban away from Tuscaloosa. If college sports were the Mafia, Texas would be the head of the Five Families. Alabama isn’t exactly Fredo Corleone, but it can’t match the overall Longhorn cachet. Saban and Mack Brown both make about $5.5 million a year. If Texas will pay that for mediocrity, what would it shell out for a perennial top-five team? All the oil leases west of Waco? Saban doesn’t need the cash, but a few million more a year might come in handy if he wants to buy a small country when he retires. Saban will never be adored like Bear Bryant or Darrell Royal. His mercenary reputation would only magnify if he took another job. But Texas offers a chance to accomplish something Bryant, Royal, Woody Hayes or Knute Rockne never imagined — win a national championship at three different schools. Now that’s a legacy. Saban turned 62 six weeks ago. He has plenty of coaching years left, but it’s hard to imagine a 65-year-old starting over. If he has one more move in him, now is the time to make it. Bob Stoops can talk all he wants about the SEC being top-heavy and overrated. That top has won seven straight BCS titles. The SEC is 24-12 against Big 12 schools the past decade. Does anybody seriously believe it’d be harder for Saban to conquer the Big 12 than the SEC? 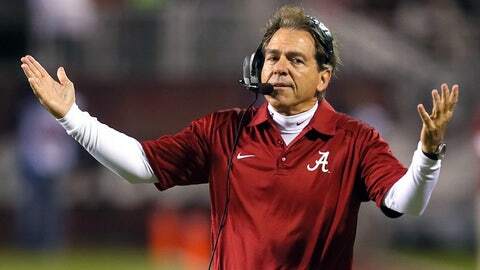 Approximately 98.3 percent of Saban’s time is consumed by football. He’d never hang out with Willie Nelson on Sixth Street, but Austin’s eclectic culture makes it one of America’s most desirable places to live. Just as Saban would be arriving, Johnny Manziel would be leaving. He personally revived the Longhorns’ most-hated rival. Texas A&M will still be good, but College Station will never again be the attention-grabbing problem it was for Brown the past couple of years, even if the two schools don’t play each other anymore. Saban said he was “not going to be the Alabama coach” days before leaving Miami to become Alabama’s coach. He has employed the usual rumor-denying coach-speak, but hasn’t made the definitive “not going to be the Texas coach” statement. This time he could leave without eating his words all the way to Austin. Texas produced almost 2,200 Division 1-FBS recruits the past five years, or more than any other state. Saban has no problem recruiting anywhere. Give him a home-state advantage and he might sign the entire first round of the 2017 NFL Draft. Texas fans are dying for a savior, which puts them where Alabama fans were six years ago. Now a lot of Crimson Tiders take success for granted. You come to a crossroads and the expectations get so great, people get spoiled by success and there gets to be a lack of appreciation, Saban’s wife, Terry, recently told the Wall Street Journal. Translation: My husband is getting tired of being taken for granted. That would not be a problem in Austin.